Engineer, author, inventor and, Intel’s director of Network and Security Technology, Perlman never cottoned to the label despite its use nearly every time she speaks at a technical conference or is written about in a story. Coined by a publication whose name she forgets — hence, “thingy” — the cringe-worthy nickname is probably something she’s stuck with. Not helping her cause is a Wikipedia entry that references the maternal moniker in the opening sentence. But also noted are her myriad accomplishments and honors: SIGCOMM lifetime achievement award and similar honor from the advanced computing systems association USENIX … lauded as one of the 20 most influential people in the tech industry by Data Communications magazine … named Silicon Valley Inventor of the Year by an intellectual property law association … an honorary doctorate from the Royal Institute of Technology of Sweden … one of three recipients of the inaugural Women of Vision Award from the Anita Borg Institute. That’s only the short list for the daughter of engineering-grounded parents. The achievement that has made Perlman a household name in certain cerebral circles is the spanning tree algorithm, which she invented in 1985 while working for the now-defunct Digital Equipment Corporation. Her protocol transformed Ethernet from a technology that could only work with a few nodes over a limited distance, into something that could create fairly large networks. Her protocol, as the name suggests, creates a spanning tree within a mesh network of connected layer-2 bridges, which are typically Ethernet switches, then disables the links that are not part of that tree. Poem? Yep, the woman who has made large contributions to many areas of network design and standardization is also a poet. Her ode to the spanning tree algorithm, titled “Algorhyme,” is a geek favorite and has even been set to music, thanks to her son, Ray. Perlman’s daughter, Dawn, an amateur opera singer, even performed it at a recital. The proud mom accompanied on piano. Perlman said she is a bit surprised that the spanning tree is what she’s most known for given that “I always thought it was a bad idea to forward Ethernet packets” and that it took her less than a week to invent the algorithm, write the specification and, of course, pen the poem. Other networking contributions include inventing concepts that made a particular type of routing protocol, called “link state routing,” stable, scalable and easy to manage. The protocol she designed for DECnet got adopted by the International Organization for Standardization and renamed IS-IS, and is the routing protocol of choice in most ISPs today. Recently she’s been working on standardizing TRILL (TRansparent Interconnection of Lots of Links), a concept she introduced to the industry that allows forwarding Ethernet packets using IS-IS instead of spanning tree. (“My apology to the world for introducing spanning tree,” she mused.) Perlman also has done important work in security, including the ability to make data expire and become unreachable, even though backups of the data still exist. When Perlman isn’t inventing or dabbling in poetry, she’s writing books. While their titles suggest dry reading that only a computer scientist would relish — “Interconnections: Bridges, Routers, Switches and Internetworking Protocols” and “Network Security: Private Communication in a Public World” — Perlman said one mustn’t judge her books by their covers. 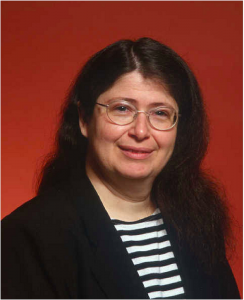 When talking about the lighter side of Radia Perlman, one must include her stab at stand-up comedy. Yes, stand-up comedy. While on a cruise to Novosibirsk, Russia to see a solar eclipse in full glory, Perlman signed up to perform in a passenger talent show. “To play piano,” she recalled. “On the day of the show, Charlie [Perlman’s significant other] and I walked around the ship and it dawned on us that we hadn’t seen a piano. When we were told there wasn’t one, I decided to try stand-up comedy. It’s something I always wanted to do. Creative writing skills and a penchant for comedy are desirable attributes, but not why Intel hired Perlman, who turns 60 in December. Based out of Redmond, Wash., she joined the company in early March as an Intel Fellow, one of the highest levels of technical achievement within the company. Now after a couple of months on the job, Perlman, who was at Sun for 13 years, and also previously worked for Novell and Digital, finds herself at a company that was never on her radar as a place of employment. Jesse Walker, a principal engineer at Intel Labs, recommended Perlman to Intel Labs Vice President Wen-Hann Wang, and the recruitment effort obviously panned out. It didn’t hurt that Perlman’s daughter had babysat Walker’s kid.